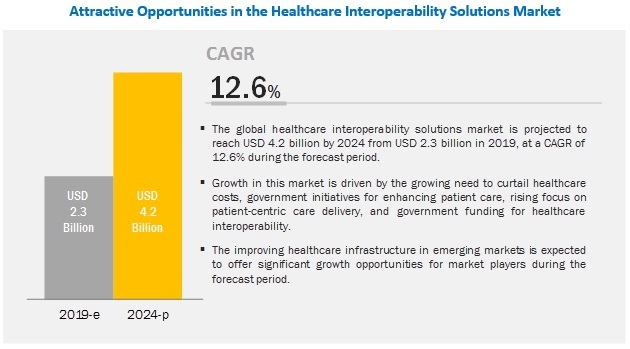 [174 Pages Report] The global healthcare interoperability solutions market is projected to reach USD 4.2 billion by 2024 from USD 2.3 billion in 2019, at a CAGR of 12.6%. The growth of this market is mainly driven by the growing need to curb increasing healthcare costs, government initiatives for enhancing patient care and safety. Also, the growing focus on patient-centric care delivery and government funding for healthcare interoperability are escalating the market growth. Based on type, the healthcare interoperability solutions market is segmented into software and services. The services accounted for the largest share of the market in 2019. The large share of this segment can be attributed to the shifting era towards cloud computing and reduced operational costs for faster and better performance of business processes and applications. Also, the recurring costs of services such as software upgradation/update and maintenance contributes to the growth of this segment. Based on software type, the healthcare interoperability solutions market is segmented into EHR interoperability solutions, lab system interoperability solutions, imaging system interoperability solutions, HIE interoperability solutions, enterprise interoperability solutions, and other interoperability solutions. The HIE interoperability solutions segment is expected to grow at the highest CAGR during the forecast period due to factors such as the need for greater access to patient health information and the growing adoption of healthcare IT solutions to enhance patient satisfaction and improve care quality. The healthcare interoperability solutions market in the North American region is expected to account for the largest market share of the global market in 2019. The rising demand for quality healthcare delivery, the need to curb increasing healthcare expenditure, and the implementation of favorable initiatives & regulations to improve the overall efficiency of healthcare organizations in the region are factors driving the adoption of healthcare interoperability solutions in North America. With marked geographical presence and established brand value, Cerner is one of the key players in the healthcare interoperability solutions market. The company has a robust product portfolio and an extensive distribution network across major markets. Cerner’s solutions are deployed through care organizations, hospitals, medical centers, free-standing reference laboratories, home health agencies, blood banks, imaging centers, pharmacies, pharmaceutical manufacturers, employers, governments, and public health organizations. Cerner focuses on further strengthening its offerings through acquisitions and product launches. The solutions offered by the company are put forward through its Cerner Open platform, which helps Cerner extend its offerings to a broad customer base. The company focuses on enhancing its market share by expanding its solution footprint with existing clients. Cerner aims to enhance its core solutions and develop new solutions and services. The company also focuses on strengthening its footprint in non-US markets by enhancing its offerings. Epic Systems offers scheduling and registration tools, billing and managed care administration applications, inpatient and outpatient core clinical systems, EHR applications, and software for managing hospital pharmacy, emergency, surgery, radiology, laboratory, and intensive care departments. The company’s core competency lies in its EHR software solutions—according to the company, about one in four physicians in the US uses the ‘Epic Care Everywhere’ EHR interoperability solution. In lieu of increasing demand for interoperability solutions, Epic has bolstered its efforts to introduce new and enhanced interoperable solutions. The firm is increasing its market share in the healthcare interoperability solutions market through its well-known EHR interoperability solutions—Share Everywhere and Care Everywhere. Also, the company launched its One Virtual System Worldwide in 2017, which helped the firm in taking a leap ahead in the interoperability market. In 2018, Epic launched the One Virtual System Worldwide, and added new features to its Care Everywhere solution. In 2016 Cerner opened a Health center at the Cerner Center in Bangalore, India, which helped the company enter the Indian market and also expand its geographic reach. In 2017, Epic launched its Share Everywhere. In 2016, Cerner launched its Open Developer Experience (code). What are the major end users of healthcare interoperability solutions market? What are the research areas of the healthcare interoperability solutions market? Which are the major healthcare interoperability solutions? Secondary research process involves the widespread use of secondary sources, directories, databases (such as Bloomberg Businessweek, Factiva, and D&B Hoovers), white papers, annual reports, companies house documents, investor presentations, and SEC filings of companies. Secondary research was used to identify and collect information useful for the extensive, technical, market-oriented, and commercial study of the healthcare interoperability solutions market. It was also used to obtain important information about the key players and market classification & segmentation according to industry trends to the bottom-most level, and key developments related to market and technology perspectives. A database of the key industry leaders was also prepared using secondary research. In the primary research process, various sources from both the supply and demand sides were interviewed to obtain qualitative and quantitative information for this report. The primary sources from the supply side include industry experts such as CEOs, vice presidents, marketing and sales directors, technology & innovation directors, and related key executives from various key companies and organizations operating in the global healthcare interoperability solutions market. The primary sources from the demand side included industry experts, such as doctors, nurses, and purchase managers in hospitals. After arriving at the market size, the total healthcare interoperability solutions market was divided into several segments and subsegments. To complete the overall market engineering process and arrive at the exact statistics for all segments & subsegments, data triangulation, and market breakdown procedures were employed, wherever applicable.